No two families are the same. Why should two homes be the same? 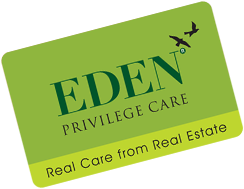 Enjoy individual care from your special friend at Eden. Need info at midnight, from London? Feel free to visit our website – www.edengroup.in – and enjoy a one-to-one chat with friends at Eden. Enjoy special gifts when you refer a friend to the Eden family. Be it ‘Godrej’ locks, ‘Jaquar’ fittings, or ‘Kone lifts, rest in the knowledge that you will receive multi-year warranties on all important products that go into the making of your home. Wary of discovering hidden charges later? Find our current prices, payment schedules and other charges clearly mentioned on our website. Take comfort in tracking the step- by-step progress of your dream home by seeing fortnightly pictorial updates on our website.